Oh precious notepad, what would I ever do without you? Well, I'd probably forget a substantial amount more than I already do. 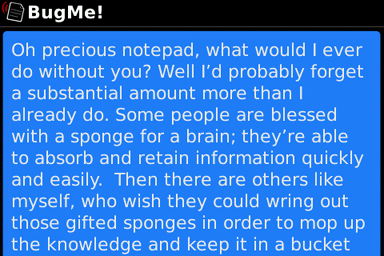 Some people are blessed with a sponge for a brain; they're able to absorb and retain information quickly and easily. Then there are others like myself, who wish they could wring out those gifted sponges in order to mop up the knowledge and keep it in a bucket for future reference. This method is not only inefficient, but it's also gruesome. Your BlackBerry smartphone, as you already know, has a note pad and task application under its hood. Keeping this in mind, there are also a number of applications you can download to help keep you on top of important dates, projects or whatever you struggle with. One of these applications you can turn to is BugMe! BugMe! is part notepad, part task manager, part alarm and part nag. Together, these many parts make up an application that allows you to create reminder notes in a cinch. 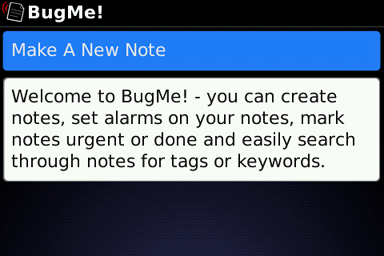 With BugMe!, you will find that you will be creating note and reminders more quickly and easily. Now instead of making a note to check out the review, why not just read it now? BugMe! has been seen on various Platforms for quite some time; from BlackBerry to Windows Mobile to Palm Treo & Centro. BugMe! is brought to you by ElectricPocket. With over 10 years of experience, ElectricPocket has produced other exciting applications, including: FlipSide, PhoneFace and Twitterlerts (just to name a few). The BugMe! application is available for BlackBerry smartphones running OS 4.2.1 and above. It is currently in version 1.0.1 and will take up 171.0KB. Despite the light hearted name, BugMe! is a no-nonsense application. It is without bells, whistles and shiny things. What it does have is determination to never let you forget. Notes are created, just as you would in MemoPad; except in this case, a note does not require you to input a title. Instead, the entire body will appear within the list of notes in the main menu. There is a drawback to this; the longer the note, the bigger the entry. You can see this below. I'm impressed as to how well integrated BugMe! is. The application allows you to share your notes via email or SMS. If desired, you can also send a copy of a note to your calendar or task application. There's even keyboard shortcut support and the ability to launch BugMe! from almost anywhere on your BlackBerry (no 3rd party apps so far). Not everyone likes a nag, but in this case, you may change your mind. BugMe! is a simple application that offers powerful features. Having the best of memos, tasks and alarms rolled into one is an added bonus. BugMe! is definitely worth a try, so you can pick up the free "3 note" trial from the CrackBerry App Store. Once you are sold, you can purchase the application for only $2.99. Now who doesn't want to be nagged? How about now?......now? ……NOW?.......now?